The interface of any program does take a while before it is usually learned. If I had a plan of action (which I don't) this tutorial should have come first. If you want to see the previous tutorial you can go to Part 1 - Importing, or you can visit the main page with all the links. This is found here in the Aperture Tutorials list. You can at any time click on the images for the full versions. If you haven't got Aperture yet it is definitely worth buying a copy. The Apple store is the best place to get it since it is usually the cheapest than 3rd parties. The main interface is as shown, you have your projects on the left, the main window in the middle, and the adjustments pane on the right. At the top of window you have the tool bar. Currently out of sight is the menu bar from Apple. At the top of the window is the tool bar. This small bar is an area which you can use to place icons for shortcuts in the program. You can customize this small area quite heavily to fit your needs. One note, as a first time user or an inexperienced person, having the names to the icons is a create help to start learning what everything does. Further along the tool bar there is the tools. These again complete small actions to photographs. Alone from the left, you have: Select, Rotate Left and Right, Straighten, Crop, Spot and Patch Tool, Red Eye, Lift and Stamp. Each of these Tools will be discussed in further detail. Further along the tool bar still, I have the loupe, Keywords HUD, Adjustments and Metadata, icons. The tool bar might be different to yours but these icons can always be accessed from other places. Moving around the window interface in a clockwise direction, is the adjustments pallet. This as shown in the buttons above can be changed between the Adjustments and Meta data. One this palette are loads of tools which can be used to change different values of your images. Each one shall be discussed in detail later. Continuing still there is the bottom part of the window. The buttons on the left are concerned about how the images are being displayed, the buttons in the middle are about rating and promoting different images in a stack or project. The image below shows the centre part of the screen. 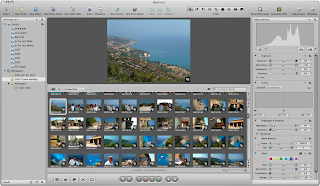 The top half is the current image or images being selected. With the bottom half showing the thumbnails. The thumbnails can be controlled with the thumbnail slider in the bottom right corner to change there size. One other main part of the interface is the project menu. 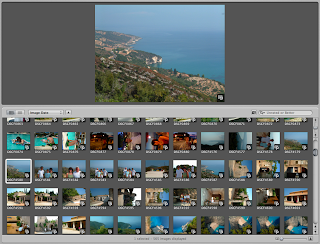 This area, much like other parts of other programs with Apple shows a tree view of your projects and images. These can be organized into folders by right clicking on the menu and selecting what you want. This will be discussed later (probably in the next post). Hopefully you have found this useful as a beginners introduction, I shall be going into a lot more detail next time about all the small details and changes that can be made. From there I will be showing you how to edit photos can make the most out of them.